I was the happy recipient of a gift of a bouquet of tulips this Mother’s Day. They held a place of honor in a vase on my dining room table for two weeks. But even though I had to say goodbye to my cut flowers, I can still enjoy a form of tulips outside in my backyard. 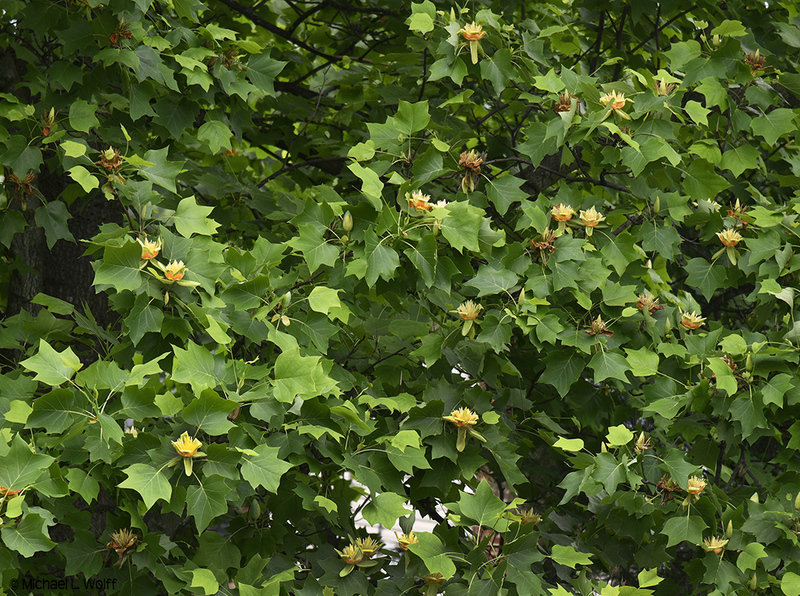 The Liriodendron tulipifera, better known as the Tulip Tree, has been offering us its own bounty of flowers. The Tulip Tree is related to magnolias and is indigenous to eastern North America. It can grow to 90 feet of more! Ours started as a small trunk and proceeded to expand. We used to be able to reach the flowers on the lower branches but as the tree reached upward, so did the flowers. The flowers are called tulips because of their shape and color though they aren’t actually tulips. They are beautiful all the same. Yet everything has its blossoming time. The petals are now beginning to fall, coating the back lawn with color. And now the rest of the garden is starting to expand. I am looking forward to the tomatoes we already planted and to the hibiscus that are just starting to peek out of the dirt. But meanwhile, I appreciate what I can see. When the flowers are all gone, the Tulip Tree will provide us with welcome shade. Ah, sitting outside with nature and being in the moment — another delightful gift. "There are two living species of tulip tree; Liriodendron tulipifera, native to eastern North America (in which the petals have the bright orange chrevron markings) and Liriodendron chinense from China and Vietnam, (where they don't). "The species we have at Leeds had come from America rather than the Orient and their evolutionary history is more or less what one would expect. They have been around since the Cretaceous. The last generation of dinosaurs would have sheltered under their branches and presumably nibbled their leaves. Fossil evidence shows that, in the warmer climate of the time, the tree occurred in the temperate band round the entire northern hemisphere. Glaciations in the ice ages wiped it out in Europe, leaving isolated pockets in Asia and North America, where presumably the two species diverged. "Since it doesn't produce flowers for fifteen years, and doesn't know when to stop growing, it's perhaps not surprising that you don't generally see either type of Tulip Tree in garden centres. But the flowers are beautiful – it has almost been worth waiting 60 years to see one. I’m used to a variety of wildlife in my neighborhood. We have squirrels, rabbits, groundhogs, chipmunks, skunks, deer, the occasional fox, and loads of birds both residential and migratory. Every now and then, however, something appears that’s startling. 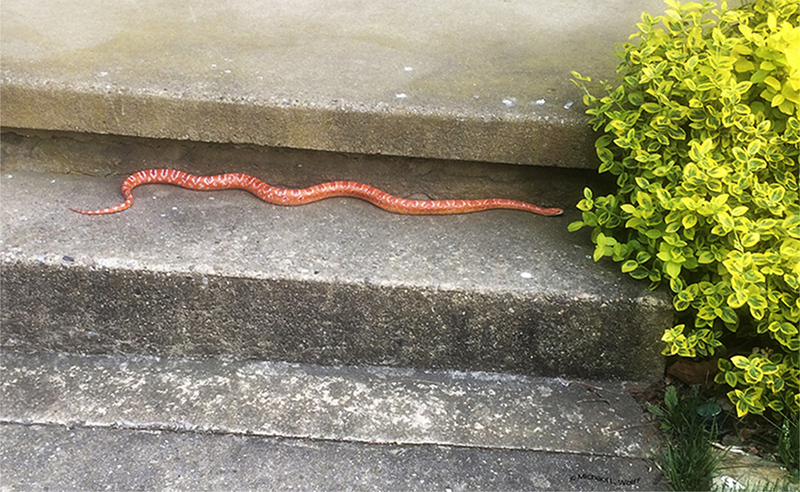 Like the orange snake that slithered across the front yard of our daughter’s house just a few blocks away. We didn’t know what kind of snake it was. Was it dangerous? Was it poisonous? Could it work its way up through pipes into the house? The township was alerted and we waited for someone to come and help us. Meanwhile, we watched it wiggle its way from the lawn, up over the front steps, into the bushes on the side of the porch. A police officer came by to assess the situation. He called the local Animal Control office and we waited some more. Meanwhile, he kept an eye on the snake’s wanderings. It moved into the neighbor’s backyard and settled in under the back deck. When the representative came, she identified the snake for us — an orange corn snake. It wasn’t poisonous but it also wasn’t local. It must have been someone’s pet that either got loose or was released by its owner. It seems that many people keep corn snakes as pets! It was a compelling creature but it needed to be relocated. She gathered it up into a container and drove it away, hopefully, to be let back into the Pine Barrens, which is its natural home in New Jersey. I can’t say I’m a snake fan but I meant it no harm and I learned that it wished us no harm either. It reminded me of the variety within nature, how sometimes we have to leave our natural homes and learn to adapt elsewhere. It’s not easy for any of us. I wished the snake well.